The southern tip of India marks the confluence of three sacred bodies of water: the Arabian Sea, the Bay of Bengal and the Indian Ocean. Here one can watch the sun rise in the east, traverse the heavens and then finally set in the west—all over the water. For thousands of years, this southern-most tip of the sub-continent has been one of India’s main pilgrimage sites, as bathing in Kanya Kumari’s waters is said to absolve one of all sins. The story behind that boon involves Lord Shiva, his consort Parvati and a demon king named Banasura. According to the legend, once upon a time the asuras [demons] gained supremacy over the devas [demigods] and adharma [unrighteousness] began to prevail. Protected by a boon that he could only be killed by a virgin girl, Banasura was wreaking havoc, driving the devas away from heaven and torturing the saints and sages. Unable to bear the agony of her children, Bhoomi Devi [Mother Earth], sought the help of Lord Vishnu, the Protector of the Universe. Vishnu advised that the devas should supplicate themselves to Parashakti, the Divine Mother, as she alone was capable of vanquishing Banasura. Seeing Parashakti in the beautiful form of Kanya Kumari, Lord Shiva fell in love [specifically the form of Lord Shiva worshipped in Suchindram, a town 15 km from India’s southern tip.] Parashakti agreed to become his bride, and arrangements were made for their marriage. At this point, the divine sage Narada realized that the marriage of Lord Shiva with Kanya Kumari would destroy the goddess’ chances of destroying Banasura, as he could not be killed by a married woman. In order to prevent this potential disaster, Narada decided to sabotage the holy couple’s wedding. First Narada tried to confuse Kanya Kumari, telling her that perhaps it was not Shiva at all who wanted to marry her, but Banasura in disguise. Narada told the goddess that she should ask Shiva to bring three items that could not be obtained anywhere in the world in order to prove his identity. These were a coconut without eyes1, a stalk of sugarcane without stump-joints and a betel leaf without veins. But Lord Shiva easily fulfilled this difficult challenge and the marriage continued to be scheduled. But Narada had a final trick up his sleeve. The marriage was to take place at midnight on a certain auspicious day. On that day, Lord Shiva began his journey from Suchindram to Kanya Kumari’s abode. When he was in the town of Vazhukkamparai [5 km from Suchindarm], Narada assumed the form of a rooster and crowed, falsely heralding the break of dawn. Thinking that he had missed the appointed hour of his marriage, Shiva returned to Suchindram. It is said that in Kanya Kumari’s anger over Shiva not arriving that she scattered all the food items that had been assembled for the wedding. The small pebbles, resembling sand, and the multi-coloured sands found on the shore in southern India are attributed to the above incident. The goddess was also heart-broken, but remained ever-dedicated to Lord Shiva and continues to perform austerities to this day with the hopes that he will one day unite with her. Soon Banasura heard about Kanya Kumari’s beauty. He decided that he would come and try her hand in marriage. She refused him. In rage, the demon decided he would take her by force. He drew his sword, but Kanya Kumari was also armed. A fierce battle took place, which ended with Kanya Kumari slaying Banasura with her chakra [divine discus] in Mahadana Puram [4 km north of Kanya Kumari]. It is said that at the moment of his death, Banasura repented for his adharmic acts and prayed to Parashakti to have compassion upon him and absolve him and anyone else who bathed in the waters off Kanya Kumari of their sins. Devi granted Banasura the boon, and this is why people come from all over the world to bathe in this holy confluence of seas. The Kanya Kumari Temple is located on those southern shores. The teenaged goddess is shown holding a māla, performing eternal austerities as she waits for Lord Shiva to come. According to the temple’s sthala purana, the idol was installed by Lord Parasurama, an incarnation of Lord Vishnu. One specialty of the idol is her diamond nose ring, which sparkles gloriously. The temple’s legend says that the nose ring was obtained from a king cobra and that light reflects off it so brightly that once an ancient mariner mistook it for a lighthouse. Sailing his ship towards the beacon, he wrecked upon the Kanya Kumari rocks. In order to prevent such a tragedy from happening again, the eastern door to the temple’s sanctum sanctorum is only opened on five special occasions throughout the year. It was to this rock and spot that Swami Vivekananda swam after two years of travelling the width and breadth of India. Here, he spent the 25th, 26th and 27th of December 1892 in meditation. During that meditation he gained the firm resolve to go to America in order to participate in the Conference of World’s Religions in Chicago and to spread the Vedanta philosophy to the West. 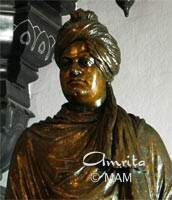 It was Swamiji’s vision that the West was suffering from spiritual bankruptcy and India material bankruptcy. He believed the scientific and technological knowhow of the West was the answer to India’s problems and that the wisdom of the Rishis was the answer to the problems of the West. In going to America, it was his desire to help the entire world. The rock is now known as Vivekananda Rock and is home to a temple dedicated to the dynamic samnyasin who shook East and West. According to another legend, Lord Hanuman dropped a piece of earth here as he was carrying the mount with the life-saving herb mrita sanjivani from the Himalayas to Lanka during the Rama-Ravana war. This chunk of earth is called Marunthuvazha Malai, [medicine-residing hills]. This is said to be the reason for the abundance of unique native plants in Kanya Kumari. 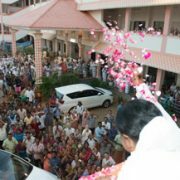 Kanya Kumari was home to a great avadhuta3 named Mayi Amma. 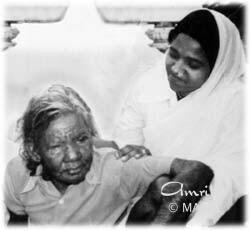 She took maha-samadhi in 1993, but the date of her birth is unknown, as she is said to have lived for more than 600 years. Her disciples were a pack of stray dogs, that lovingly followed her everywhere. She would swim naked to one of the rocks off the tip of the coast and sit under the hot sun for hours, as if lost to the world. Her dogs would swim after her, and sit at her side. 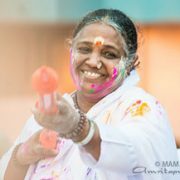 During one of Amma’s visits to Kanya Kumari in the early 1980s, Amma met Mayi Amma, a rare encountre between two sages. 1 A coconut has three “eyes” where it sprouts when it takes to seed. 2 Amma has been to the rock memorial in the early 1980s. 3 A Self-realised master who acts as if mad, following none of the social norms. The Reclining God of Tiruvanantapuram Why did you leave us?